It’s religiously important for Muslims, Christians and Jews. For Zionists, it’s the symbol of Judaism’s revival and prominence. For Christians, it’s where Jesus lived and died. For Muslims, it’s their third holiest site (location of the Al-Aqsa Mosque) – after Mecca’s Sacred Mosque and Mosque of the Prophet in Madina. After its 1967 annexation, East Jerusalem underwent legal and bureaucratic changes to its physical, cultural and spiritual character under Israel’s Judaization plan. Settlements were established and expanded on stolen Palestinian land. Decades of ethnic cleansing, home demolitions, the Separation Wall, and other draconian measures followed, aiming to entirely Judaize the city. Palestinian culture and religious heritage are threatened by the establishment of “facts on the ground,” a process ongoing for half a century this month. Trump earlier said Israel wants America’s embassy there. 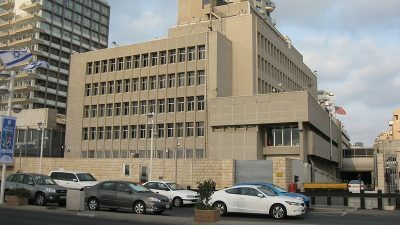 US and Israeli media reports now say he’s expected to renew the waiver on keeping Washington’s embassy in Tel Aviv before a Thursday midnight deadline – though he still envisions an eventual move, according to unnamed senior White House officials. His waiver will reportedly delay moving America’s embassy for six months, reconsideration again at that time. Arab leaders and others warned Trump against making the move, explaining it would incite anti-American hostility throughout the Muslim world more than already. It would kill another peace process attempt before initiated. Trump administration officials are divided on the move. Supporters include chief White House strategist Steve Bannon, Trump’s Zionist ambassador to Israel David Friedman and neocon UN envoy Nikki Haley. Secretary of State Tillerson, Defense Secretary Mattis and National Security Advisor McMaster oppose the move. On May 25, the Senate Foreign Relations Committee commemorated the 50th anniversary of Israel’s June 1967 Six-Day War (of aggression) and Jerusalem’s reunification under its control – by unanimous bipartisan voice vote. The action reaffirmed the 1995 Jerusalem Embassy Act, calling the city “the capital of the State of Israel.” Full Senate and House action are expected to follow.